How to Get from Lisbon Airport to Batalha? Are you visiting Portugal soon? If you are travelling to Batalha, most likely you will arrive at Lisbon Airport. To appreciate a comfortable journey from Lisbon Airport to Batalha a good and economic alternative to avoid all the hassle of public transports and expensive normal taxi fares is to book a private Lisbon Airport transfer to Batalha. We will transport you directly between Lisbon Airport and your accommodation in Batalha, both for your arrival and departure flights. Select Batalha as your transfer destination area and provide us with flight details, Batalha accommodation address and contact. We automatically process your request for transport availability to Batalha and send a booking voucher with your transfer confirmation in a matter of seconds. At Lisbon Airport arrivals terminal a friendly driver will be waiting for you next to a placard with our website logo. For the return transfer we will pick you up from the same address in Batalha. And remember, you can always pay later to the driver for both your arrival and return Batalha transfer. How far is Batalha from Lisbon Airport? How much will it cost? How long? The travel distance between Lisbon Airport and Batalha is 103Km and transfer time takes approximatly 145mins under normal traffic conditions. 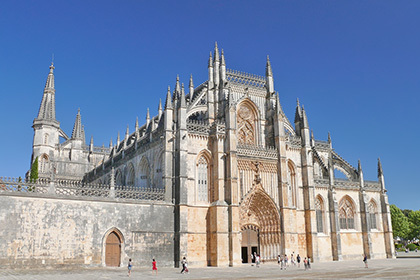 Private taxis for Lisbon transfers to Batalha with fixed rates. A much more faster, affordable and hassle free transport to Batalha alternative. One of our friendly drivers will meet and greet you at Lisbon Airport arrivals hall and assist you with all the luggage. He will guide you to your assigned transfer vehicle, which may vary from an estate or executive saloon for up to 4 passengers to a modern mini-bus or people carrier van up to 16 passengers. You will be relaxing at your Batalha resort, hotel or private villa in approximately 145 minutes. Batalha is a portuguese town situated north of Lisbon in the Leiria district. The town was founded in the 14th century when the king D. João I decided to build in 1388 a monastery to commemorate the Portuguese victory over the Castilians at the Aljubarrota battle in 1385. Called Santa Maria da Vitória da Batalha, the monastery has become one of the most important gothic style monuments in Portugal, profoundly influenced by Manueline art. Example of such influence can be seen in its masterpiece, the Royal Cloister. Batalha’s monastery is protected by UNESCO as a World Heritage monument and is also one of Europe’s most important gothic masterpieces. Near Batalha, you can also find a small town called Porto de Mós with a distinctive 13th century castle and underground caves in the nearby town of Mira de Aire. Our private transfer service at Lisbon Airport will transport you directly to and from any resort, hotel or private holiday villas / apartments in the Batalha area. To pre-book taxi transfers from Lisbon Airport to Batalha or to other near by destinations take a look at our full list of taxi transfers fares & prices for all the covered locations in Portugal.